Kilauea Volcano made headlines around the world a month ago after fissures in the Leilani Estates subdivision in Puna opened, slowly at first, then with spectacular displays of lava bursts soaring hundreds of feet into the air. More images and video are coming out of Puna of the beauty and destruction, and tourism officials and businesses have seen a drop in bookings that could have a lasting impact on the Big Island’s economy. They decry the negative impact of sensationalism. A recent video of an apparently deranged man repeatedly firing a handgun in the direction of an area resident hasn’t helped, either (the resident was not hurt and the gunman has been arrested and charged). 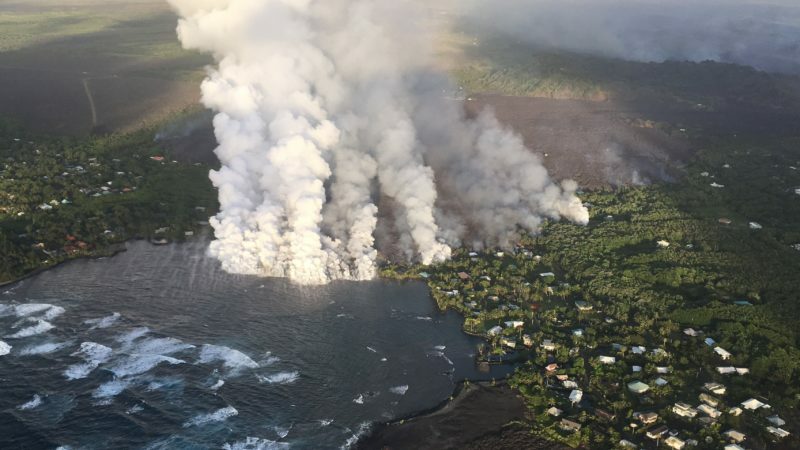 Lava enters Kapoho Bay. Courtesy US Geological Survey. Those in the tourism industry have stepped up efforts to get the message out that the vast majority of the Hawaiian Islands are unaffected by the Kilauea Volcano eruption. Trade winds have seen some parts of the Big Island impacted by ashfall and “vog.” But most of Hawaii’s largest island has seen little or no effect from the volcanic activity in Puna. 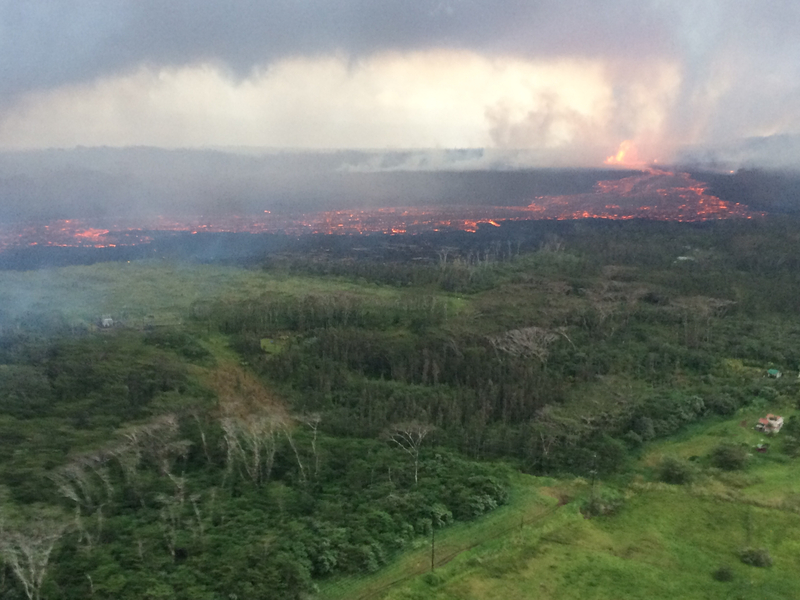 As of June 4, more than 100 structures have been destroyed by the lava flow or new fissures. Mandatory evacuations have been ordered in the most severely affected areas. The lava flow from Fissure 8 has reached the ocean in Kapoho, where the width of the flow has been measured at a half-mile. Toxic “laze” remains a concern in the area where the lava has reached the ocean. And lighter airborne particulates may be present in the area. Some residents who did not heed evacuation advisories have had to be airlifted out of the area after being isolated by the lava flow. The flow has been moving rapidly in some areas, more slowly in others. Kilauea Volcano moving through Kapoho. Courtesy US Geological Survey. Evacuation shelters are at capacity, as many residents have permanently lost their homes or access to their properties due to the lava flow. Mayor Harry Kim has floated a plan to create a new housing initiative for lava flow refugees. It is similar to one created in the aftermath of the devastating 1960 Hilo tsunami. There has been a staggering amount of seismic area in and around the Kilauea Volcano. A 5.3 magnitude quake shook the Big Island Sunday, June 3, rattling visitors and residents as far away as Kailua-Kona. A staggering 4,727 temblors have been recorded in the month since eruptive activity began four weeks ago. Scientists studying the eruption have said that a tsunami resulting from seismic activity is highly unlikely. The Big Island is open for business. There are great deals to be had for airfare and accommodation. Let Hawaii-Aloha Travel help you navigate the gush of news and deals coming from the Kilauea Volcano eruption. For updates on Kilauea Volcano activity, click here.